Does the Quran support Variant Readings? 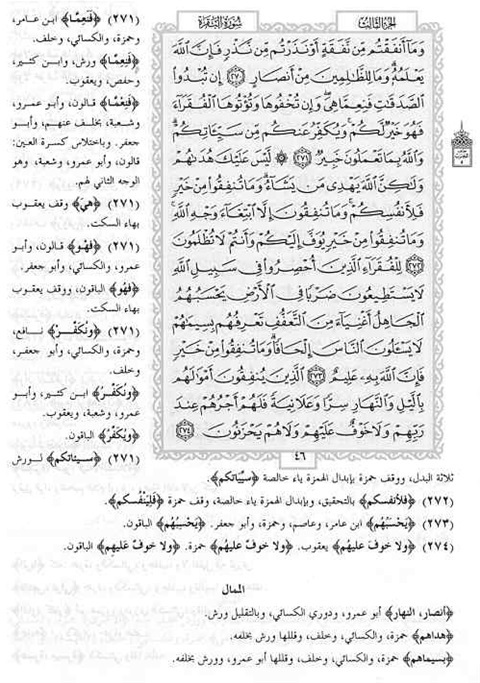 Often in Polemical arguments, the issue of the Quran’s variant recitations is raised to cast doubt and dispute the preservation of the Quran. However, Muslims (who are sufficiently versed) are aware of these variant recitations and traditionally accept these various readings [particular methods of reciting the Quran] as authoritative (i.e. attributed to Prophet Muhammad peace be upon him). Although, the laity may not be versed or even aware of these various methods of reciting the Quran, in general they accept that there are various authorative readings. Many well-versed reciters of Quran have learnt, recited and imparted these readings for centuries and continue to do so. It is alleged that the Qur’ān has variant readings. Typically a verse may have more than one variation. These variations are not merely in pronunciation, they exist, for example, in addition or deletions of words, in the singular and plural form of words, in declensions and in verb structures. It is generally believed that these variations have been divinely revealed. Most scholars acknowledge that the ‘variant readings’ of the Quran need to be transmitted by the multitude (Arabic: Mutawatir) from the contemporaries of the Prophet (peace be upon him), for validity. Prophet Muhammad (peace be upon him), 'Abdu'llah Ibn Mas'ud, Zirr Ibn Hubaysh Abu 'Abdu'l-Rahman Sullami Abu 'Amr Shaybani, 'Asim Ibn Abi Najwad, Hafs Ibn Sulayman Abu Bakr 'Ayyash. Prophet Muhammad (peace be upon him), 'Ali 'Uthman, Zirr Ibn Hubaysh Abu 'Abdu'l-Rahman Sullami, 'Asim Ibn Abi Najwad, Hafs Ibn Sulayman Abu Bakr 'Ayyash. To perplex the matter further - …not only are these readings isolate reports (Ahad), but also many of the narrators of these readings are not regarded as trustworthy by the scholars of 'Ilmu'l-Rijal [biography of the narrators] as far as accepting Ahadith [tradition of the Prophet] from them is concerned. Thus, the inconsistency of accepting such unreliable narrators concerning the ‘variant readings’ of the Quran is evident. So why do the clerical class of Muslim scholars accept the so-called variant readings of the Quran? Perhaps they deemed that if they did not accept these reports, they would have to reject or cast doubt in the vast reports regarding the Prophet’s alleged sayings, actions and tacit approval or criticism (i.e. Hadiths). However, what is being read by the common masses and accepted or agreed upon - both by the common masses and scholars alike, is only one version of the Quran. That has been transmitted from the common masses of the contemporaries of the Prophet (peace be upon him) to next generation of common masses and then to the next perpetually. Many Muslims are 'programmed' into accepting the deductions and opinions of the clerical class of Muslim scholars without any critical thinking or mechanism of verification and thus often have the impression that the status of the ‘variant readings’ is that of The Quran. While at the same time denigrating the various versions of the Gospels or the Bible based upon the very similar premise, yet they are expected to accept the ‘variants readings’ of the Quran. Albeit these variant readings are insignificant in regards to the overarching message found in their manuscripts and are in the main agreeable to the universal reading of the Quran. Nevertheless, these ‘variant readings’ have no authorisation from the Quran’s perspective but have come about due to secondary sources. Naturally, human errors may have occurred in some manuscripts or codices of individuals, but it is cogent to conclude that God preserved the universal reading of The Quran not only in the written form but via the en masse oral transmission of the common masses from generation to generation which superseded any written manuscript transmitted by individuals.